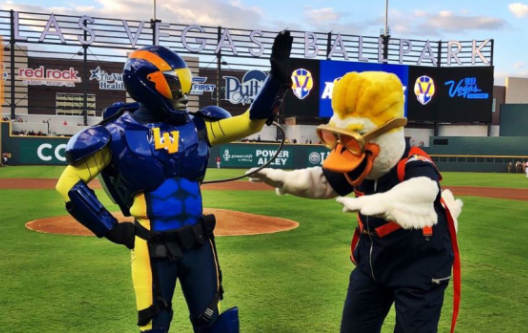 The new mascots for the Las Vegas Aviators -- Spruce and Aviator -- were unveiled last night in true Las Vegas fashion. LAS VEGAS (KTNV) — The new mascots for the Las Vegas Aviators -- Spruce and Aviator -- were unveiled last night in true Las Vegas fashion. Created to illuminate and celebrate the team’s new aviation-themed moniker, the mascots made their debut on April 9, at the season opener and first-ever game played at Las Vegas Ballpark. “With a new name, a new Ballpark and a new affiliation with the Oakland Athletics, the Las Vegas Aviators have launched an exciting new chapter in the team’s 37-year history,” said Don Logan, President and COO, Las Vegas Aviators. “The mascots are a fun way to better connect the team with the community, not only on game days but throughout the year,” he said. Originally from Las Vegas, Spruce is a goose who lived in the Bellagio fountain as a gosling. From a very early age, he was involved in “Show Biz,” given that his parents were part of a magic act on the Strip. In his new role as the Aviators’ mascot, he is thrilled to be following in their entertainment footsteps. Spruce now lives at the Ballpark full-time and dreams of being a great flyer and adventurer like his hero and fellow mascot, Aviator. True to Spruce’s roots, he’s a larger-than-life character who is always getting in over his head. His favorite food is the Hungry Hotshots Kids Meal at Las Vegas Ballpark; and his favorite film is “Top Gun,” of course. While Spruce is an open book, Aviator is a bit of a mystery. No one knows exactly where he came from or how he ended up at Las Vegas Ballpark, but his flight suit and gear are really out of this world, suggesting he’s had some pretty fantastic adventures and seen some astonishing places. Rumor has it Aviator is an ex-pilot once stationed at Nellis Airforce base where he was testing the top secret “Intergalactic Jet Propulsion System” that appears on his flight suit today. He is still engaged in classified missions and, for this reason, he can never reveal his true identity. Aviator loves The Hercules hotdog, part of the specialty FlyDog collection served at Las Vegas Ballpark. His favorite movie? “The Aviator,” of course!